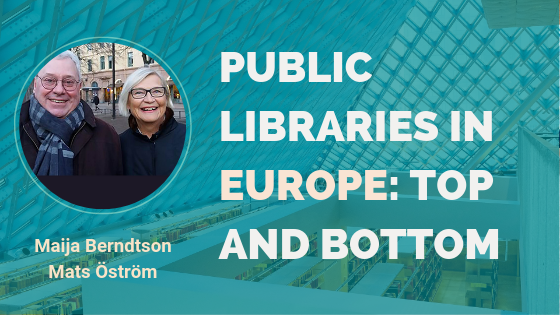 This month, we present Library Ranking Europe (LRE), a ranking system created by Maija Berndtson and Mats Öström that focuses on the ability of different European libraries to offer services to its customers. We have talked with the founders of the project Maija Berndtson, who has worked as Library Director of Helsinki City Library (1987-2013) and Mats Öström, who has worked as Library Director and Director of Culture in Swedish municipalities (1974-2011). They tell us more about the concept and how libraries can benefit from using it. Read more insights below. 1. What is your project about and what is your mission? The project Library Ranking Europe (LRE) aims to create a ranking system that stimulates benchmarking and strengthens the citizen and customer aspect in developing European public libraries. The criteria of our pilot project are based on the perspective and the needs of the citizen and customer. LRE really makes it possible to compare libraries in big cities and small villages. You can find top public libraries in Europe in Linz, Helsingör, Esbo, and Herning. And you can find rather poor public libraries in cities like Bratislava, Rimini, Haapsalu, and Malaga. Now we have an embryo to a European ranking system for public libraries. 2. How did you create the ranking system and how is it set up? The values of our assessment come from the Nordic public library ideology and tradition. In the Nordic countries, public libraries are important for democracy and freedom of expression, information supply, culture, education, research, and social development. Equality is highly desirable and services being free of charge are essential. In our evaluation, we use the method of Mystery Shopping which are anonymous visits. The ranking system which we use during our visits in libraries has different aspects which are based on our values and on the customer perspective. The whole ranking system can be seen on our website www.libraryranking.com. It consists of main categories such as information about the library and its site, visibility and access, service and supply, premises, choice of collection and freedom of expression and of choice. For example, in the subcategories we look at what kind of information there is about the library, how easy it is to find the library, how long are the opening hours and how accessible the premises are for those who are disabled. The main category, ‘services and supply’, includes matters like media and fees, programs, special services, information technology, cafés, lavatories, and identifiable staff. In the category ‘premises’, we assess aesthetics, lighting, seating, and possibilities to be and work in silence or to be social. The versatility of the supply of media and the presence of controversial titles and authors are also evaluated. In our evaluation, we score every subcategory and get a total amount of scores. The LRE scale generates a ranking system that categorizes libraries according to the scores. We have a scale of six stars from the lowest “Poor” to the highest “Exceptional”. 3. How is the ranking system you created different from others? The difference of our ranking system with many other existing assessment systems is that we look at the ability of the library to offer services to its customers. We do not study statistics, resources or management as is the case in the Quality Assessment for instance. You can also find ranking lists presenting the most beautiful libraries. That does not have much to do with the quality of services or with the customer comfort. We have started LRE four years ago as a pilot project to test our system. So far, we have evaluated over 60 libraries in 14 European countries. After these evaluations, we are rather convinced that the system works. Our ambition is to visit, to review and to rank public libraries in all kinds of municipalities in Europe, no town or city is too small. The size of the municipality or the size of the library is not of crucial importance when talking about the quality of services. Even libraries in smaller towns have reached five stars, the ‘Excellent’ level, and some bigger cities have one star, ‘Poor’ libraries. The biggest part of the libraries belongs to the middle groups, from three to five stars, from ‘Good’ to ‘Excellent’. Libraries can also be ‘Very good’, four stars and ‘Acceptable’, two stars. With so many remarkable libraries all over Europe, we are surprised that hardly any of them are marked on the printed city maps, not to mention, in the guidebooks for tourists. Instead, the national libraries or university libraries – which are sometimes closed for the public – are mentioned. As free spaces and significant cultural institutions, public libraries should, at least in bigger cities, market their premises and services for tourists and guests. With LRE, we want to introduce a totally new tool and method to stimulate benchmarking and the development of quality among European public libraries. LRE offers an easy way to compare public libraries in different countries and to strengthen the possibilities for a European library discussion over international borders, not only among librarians but also together with European politicians, decision-makers and institutions. LRE is also a development tool for a single library. Our custom is to do the visits totally anonymous without any contact with the library in advance. But after the visit, LRE can tell in more details, give feedback, how the library could improve its services. Sometimes changes that are not expensive can mean a lot for the customer. 4. How do you envision the project evolving in the future? We still go on testing our system and try to develop it further. But sometime in the future, we hope that an established institution or organization can take responsibility for the system, develop it, enlarge it and evaluate more libraries. In all, the European public libraries ought to cooperate more to strengthen their positions in their own countries and within the EU. They also could be more visible. All Europe´s public library units deserve a joint symbol, a logotype, like tourist businesses have the I-symbol. Not to have a shared trademark for libraries within the EU is both short-sighted and defensive. The public libraries have everything to gain if they stick together and demonstrate that they really collaborate in an effective network. A joint symbol connected with a star system like hotels would be still more customer friendly and would encourage the libraries to improve their services. Simply to decide on, and introduce, a joint symbol for Europe´s public libraries would make them dramatically more visible. But most important is the development of quality and usefulness for the citizens. Mystery shopping from a customer perspective and ranking can be a new tool in this ambition.